One of my favorite clients recently gave me a cookbook that we are planning to cook through for various meals and dinner parties in the future. 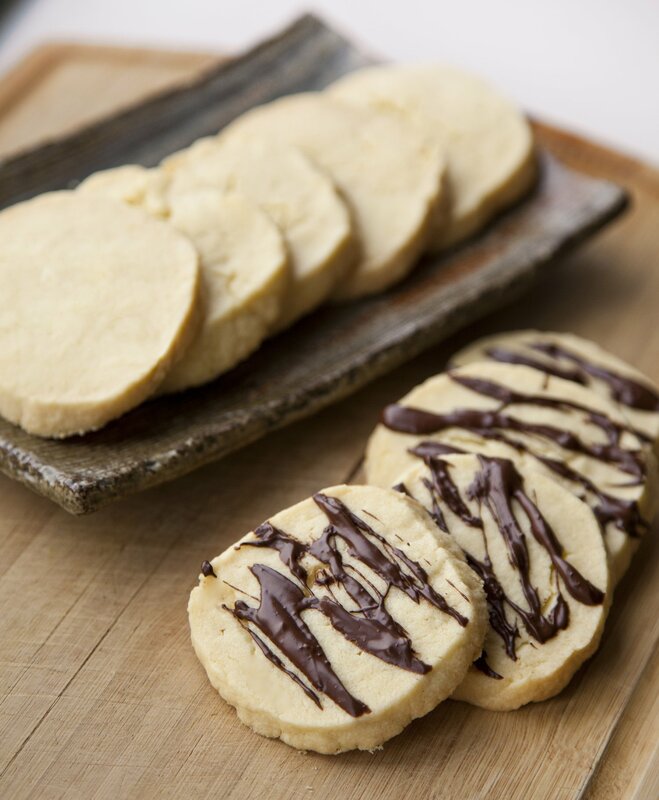 Today, amongst various savory dishes, she requested I make the cookbook’s Shortbread Cookies. Dread immediately set in. 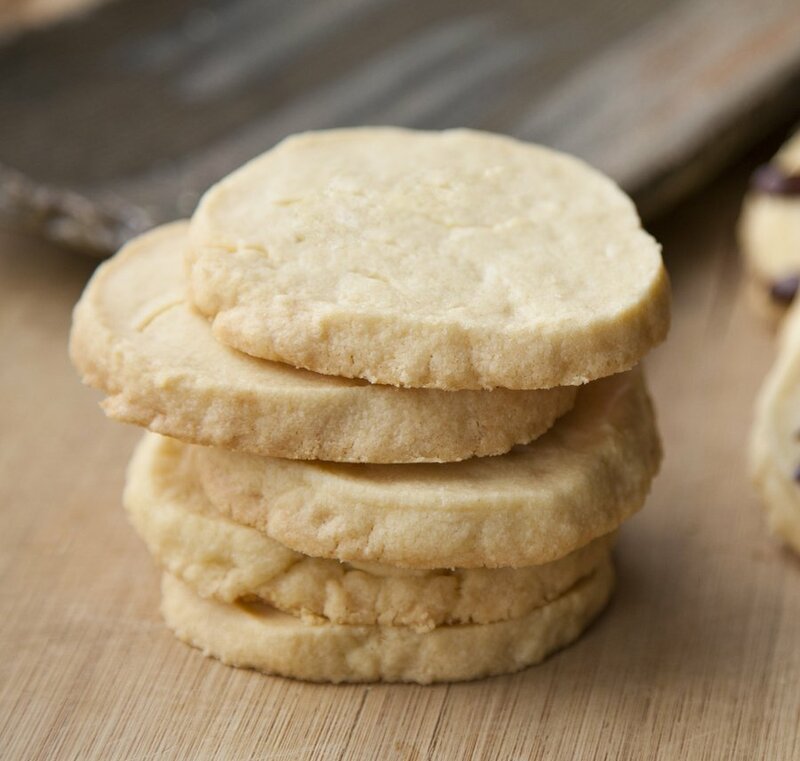 I have made Shortbread Cookies before, and have always had a difficult time with them, resulting in ugly cookies, and many 4 letter words being uttered from my mouth…but thankfully, not only was this cooking experience explicative-free, but these cookies are to die for! The issue I would normally have with Shortbread cookies would be that the dough was too crumbly, and when you got to the step of slicing them or cutting them with cookie cutters, the dough would crumble into a mess and I would cry (if you haven’t cried while baking, you clearly haven’t experienced the gamut of baking emotions). This recipe was much easier to work with (thank you baking Gods). 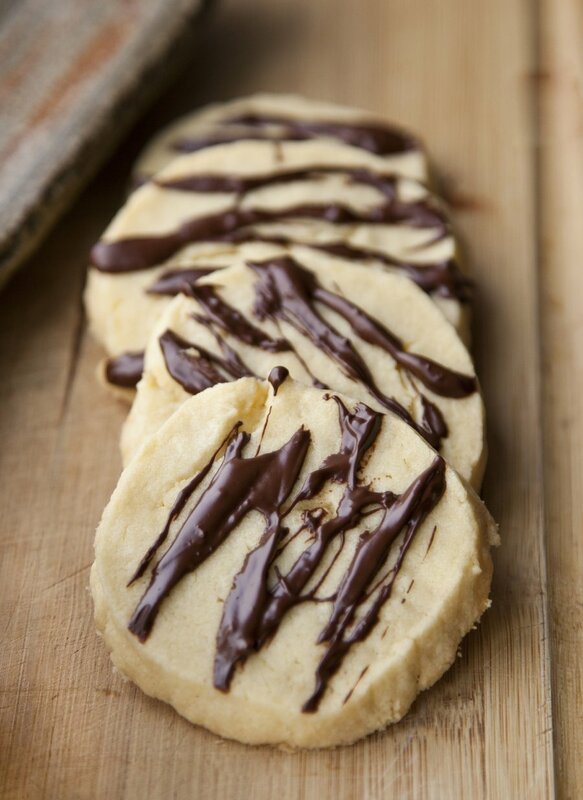 I decided to make the cookies two ways – one plain (my favorite) and one with a little drizzle of chocolate! Another thing to mention was that I chose to roll my cookie dough into a log and then slice rounds from it to make my cookie shape…you can do this OR you can roll your dough out onto a lightly floured surface to ¼” thick, and cut the cookies out with cookie cutters (something fun you can do with your kids!) You can also decorate them with sprinkles or icing to make them more kid-friendly looking (I know as a kid I was partial to any dessert adorned with various colors…and still am). 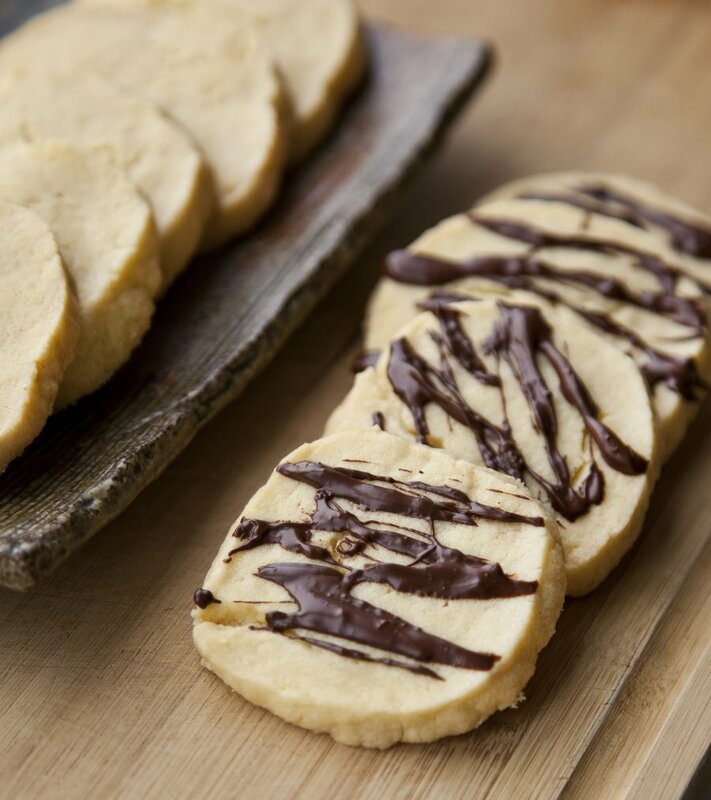 The best Shortbread Cookie recipe you'll ever taste! In a large bowl, add your butter and sugar. Using an electric mixer, beat together the butter and sugar until a creamy consistency. Add in your egg yolk, and beat together until just combined. Add in your flour, cornstarch and salt, and using a rubber spatula, mix together everything until it's fully combined. 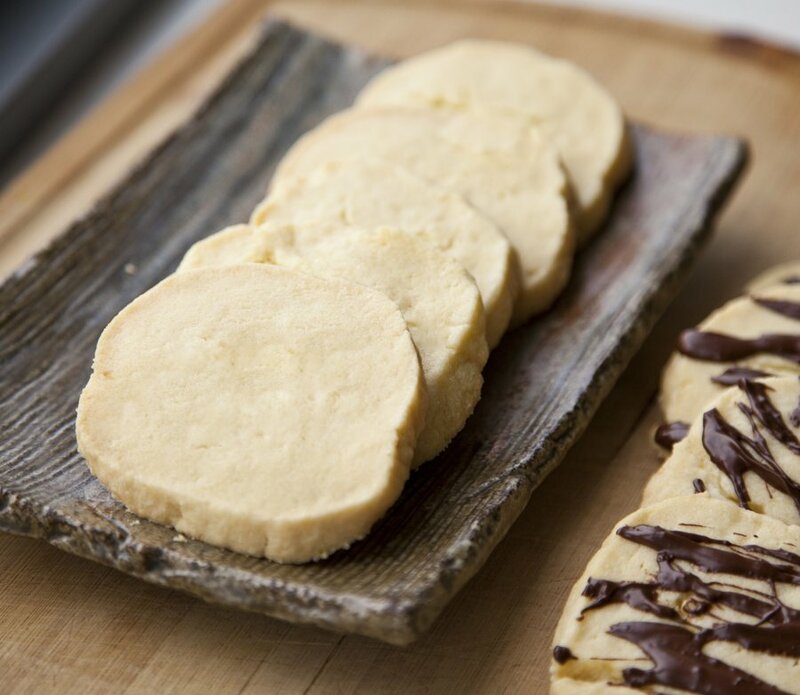 Turn out your cookie dough onto a sheet of plastic wrap and form the dough into a log (about 2-3 inches thick), and wrap the plastic wrap around the dough tight. Place the dough in the fridge for 30 minutes to allow it to harden. Preheat your oven to 275 degrees. 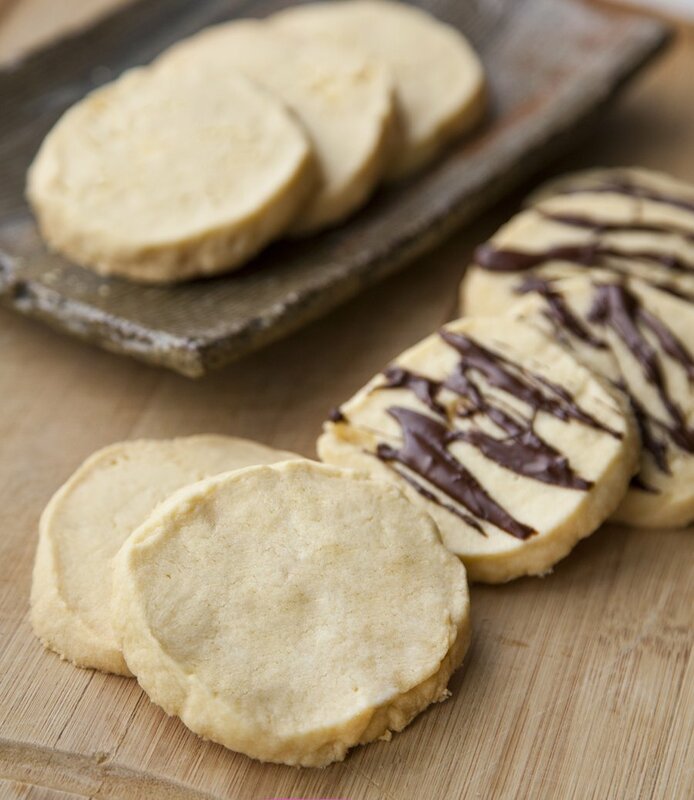 On an un-greased cookie sheet, cut 1/4" thick slices from your cookie dough log and place on the baking sheet (leaving about an inch of room between the cookies). Bake for 25-30 minutes or until the bottoms are just slightly browned. Remove from oven and let the cookies cool on the baking sheet for 5 minutes. Carefully remove the cookies with a metal spatula and place on a cooling rack. Let cool 10 minutes. At this point you can serve them plain, or melt your chocolate in a glass bowl in the microwave for 20 seconds, stir, and drizzle over the tops of the cookies.